2017 31 Tattoos in memory of Extortion 17 - Valhalla Tattoo and Gallery "Southern Pines Premier Tattoo Location"
We are happy to announce that our 5th annual 31 Tattoos in memory of Extortion 17 will be held on Saturday 5 August 2017. 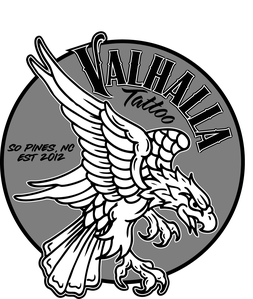 5 Aug 17 Valhalla Tattoo and Gallery (Southern Pines NC) will host our 5th annual charity event to remember the 31 lives lost on 6 Aug 11 when a Chinook was shot down in Afghanistan. Often it is referred to by the Chinook's call sign, Extortion 17 and was the highest single day loss of life to US forces in Afghanistan. It holds a place near and dear to our hearts and we are honored to remember those lost. Proceeds from the event will be donated to Special Operations Warrior Foundation.